In search of Zotero compatibility. Neither of the above meta data are correct for a book. How can I resolve this? Noteworthy that the Title, Author, Language, and URL are translated from PB correctly into Zotero. Installing the Zotpress changes the metadata capture of the book homepage to a Web Page Item Type, preserving Title but not Author or Date. I've recently taken over the website for my organization. I tried to figure out - https://github.com/bwiernik/WP-Citation-Metadata/ - but no success. I would be nice if PB inherently provided fully formed citation metadata, as it is designed for open e-literature. In addition, Zotpress could be a welcome addition to PB. Pressbooks roots are showing in the fictional world when you can’t retrieve good citation metadata from a book site page (or well formed and embedded in a PDF or EPUB download). Publishing sites that I can click with the “Save to Zotero” button (in web browser), that download well formed metadata to Zotero Manager DB are wonderful. 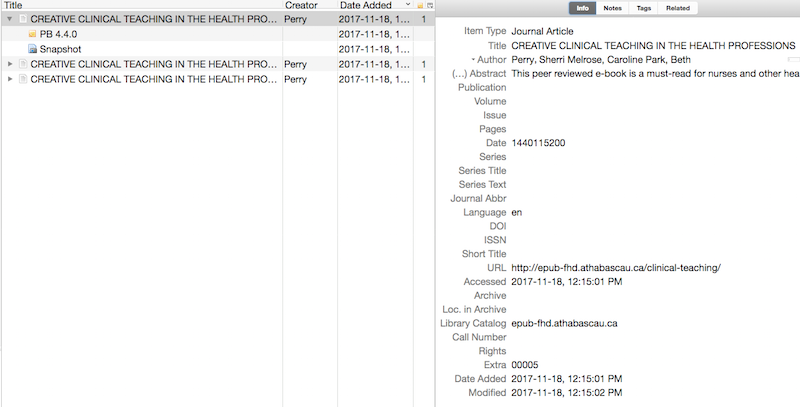 Even the Open Journal System OJS (https://pkp.sfu.ca/ojs/) is much better at working with Zotero, and OJS is a traditional - fire and forget - publishing model. If Pressbooks wants to play in the academic arena then where is the metadata? The old advert use to be Where’s the Beef? now academically virtualized to Where’s the citation? PS1. the only work-around I see is to create a Zotero Export file of the book citation and attach it to the book page. How medieval is that? PS2. Now if they could combine OJS and Pressbooks, that would be an interesting evolutionary species. @swettenham We take interest in all subjects posted in this forum and incorporate them into our roadmap wherever possible. The fact that we have not responded with a confirmed timeline for adding citation metadata to Pressbooks books does not mean that we aren’t actively considering it. Our small team (which includes just two developers and two support staff) are tasked with maintaining three open source plugins, a half dozen other plugins for our paying clients, over 50 themes, and infrastructure for over 150 Pressbooks networks that we host for our paying clients. Please understand this context in which we’ve received your feature request. It would be very helpful if you could provide links to clear specifications for supported citation metadata formats or, even better, an HTML snippet of Zotero-compatible citation metadata for a book that we could use to build upon. We also welcome pull requests! I was really hoping Zoteropress WP plugin (https://wordpress.org/plugins/zotpress/) would solve instant citations, but it did not - as yet. Since Zoe has a suggestion form now, I will funnel plugin ideas through that channel. FYI, Pressbooks Book 1.11 (out today) removes the default WordPress generator meta tag which will stop Zotero from identifying Pressbooks books as blogs. More improvements in this area to come in the future. Is there a setting I need to do in Book Info or somewhere else to designate Citation Item Type? Steve–have you looked into writing a Zotero translator for general Pressbooks installations: https://www.zotero.org/support/dev/translators? Could that help with this issue? Thanks, that is an interesting link, in particular the web translators. However, I am not a coder by nature and PB code is very complex set of linkages. I defer to others on the integration of metadata in PB. Citation metadata is a partial answer to the metadata quandary of objects, content, and systems. Content management systems such as https://pkp.sfu.ca/ are able to deliver citation metadata that is conveniently and correctly retrieved by Zotero. In the academic world, a system that can provide detailed and accurate metadata is extremely useful …from an enduser perspective. My biggest problem with properly adding Zotero support is that many of the relevant links from their site are broken. Hi all–I’ve been a heavy user of Zotero in my own scholarly routine for several years, and know that it has lots of academic users as a terrific piece of open-source citation management software. While the software is still being actively maintained (largely by Dan Stillman: https://twitter.com/danstillman), with new releases coming out regularly (see their changelog), I agree that their website and documentation is pretty badly in need of updating. Who ever heard of outstanding open source software projects with documentation issues, eh? Like Steve, I’d love to see Pressbooks content play nicely with Zotero. My view is that the first step would be implementation of the proposed metadata improvements that Ned and others have been working on–having schema.org microdata in each page header, etc. Once that has been implemented and propagated across a Pressbooks network, if these metadata import issues persist, we might want then to contact Dan Stillman or other knowledgeable folks from the Zotero community about ways to better ensure that Zotero correctly interprets/translates the metadata exposed on various Pressbooks chapters, etc. I’d be willing to help coordinate/broker meetings if it would be of any help? I have tried all the WP plugins suggested on the Zotero site with PB to no avail. I concur with StellWagstaff (Metadata - Book Info - Zotero Citation manager) that the Zotero website needs an upgrade. Back in 2011/12 it was very active in support but now appears strained. However, Zotero has improved greatly since then, and is closer to a citation management system than a simple citation manager, operating on multi-platforms. Thank you to everyone for looking into this. PS. Mendely (as per “Mendeley CSL-JSON” - https://github.com/citation-style-language/schema by Ned) seems to continue getting attention, but requires enduser login to function. Mendeley was purchased by Elsevier in 2013, making them anathema to a lot of open community folks (one example of a common anti-Elsevier argument in academia). Some other perspectives on post-Elsevier Mendeley development here and here. My basic view is that no matter which citation management tool a user prefers (and there are several in use in the academic community), the goal for Pressbooks should be to produce clean, well-formatted, standards compliant metadata for both books and atomic elements (e.g. chapters, front matter, etc.) of that book. In the few years that I’ve been a part of the Pressbooks community, I’ve seen big strides made to that effect, and I have confidence that even more metadata improvements will be coming soon. My question is: how can interested people like Steve and myself (or the many metadata and citation management savvy librarians involved in open publishing) best contribute to Pressbooks development roadmap. How can we be useful–to make the burden lighter rather than heavier on Ned, Dac, Hugh, and others working on Pressbooks development? Thanks for the note about Mendeley. Interesting. As per my earlier post, we would appreciate this kind of help with this issue. It would be very helpful if you could provide links to clear specifications for supported citation metadata formats or, even better, an HTML snippet of Zotero-compatible citation metadata for a book that we could use to build upon. Right now we provide Schema.org metadata using microdata. In a forthcoming release, we will likely switch to using JSON-LD. For reasons that are incomprehensible to me, Zotero does not yet support Schema.org metadata in microdata, RDF or JSON-LD formats (see here). It would be great if those interested in this feature could give a +1 to that issue. We stoped for now, but I hope soon I can keep working with that. My purpose is to teach languages with Siri. A lot of metadata is neccesary. @sswettenham fixed in https://github.com/pressbooks/pressbooks-book/pull/499. Frustratingly, none of the Zotero translators supported JSON-LD (Schema.org) metadata. We ended up using Highwire Press tags, which aren’t really documented… So it goes.